In many minds, the formal tea ceremony is an iconic representation of Japanese culture, and today it is even more ingrained in the Japanese lifestyle than it is in China, from which the ceremony was borrowed nearly 900 years ago. The tea cermony is in many ways synonymous with Zen since both arrived in Japan from China at the same time. "Tea ceremony" is not the best translation of chado, which literally means "tea way" ("cha" means "tea"; "do" means "way"). Chado, also called cha no yu ("tea hot water") isn't a ceremony involving tea. It is just tea; just this moment, fully experienced and appreciated. Through meticulous attention to every detail of preparing and drinking tea, the participants enter into a shared, intimate experience of tea. Tea had long been valued by Ch'an monks in China to keep them awake during meditation. According to legend, when Bodhidharma, the founder of Ch'an (Zen), struggled to stay awake during meditation, he ripped his eyelids off, and tea plants sprang from the discarded eyelids. Beginning about the 9th century, Japanese Buddhist monks who traveled to China to study returned with tea. 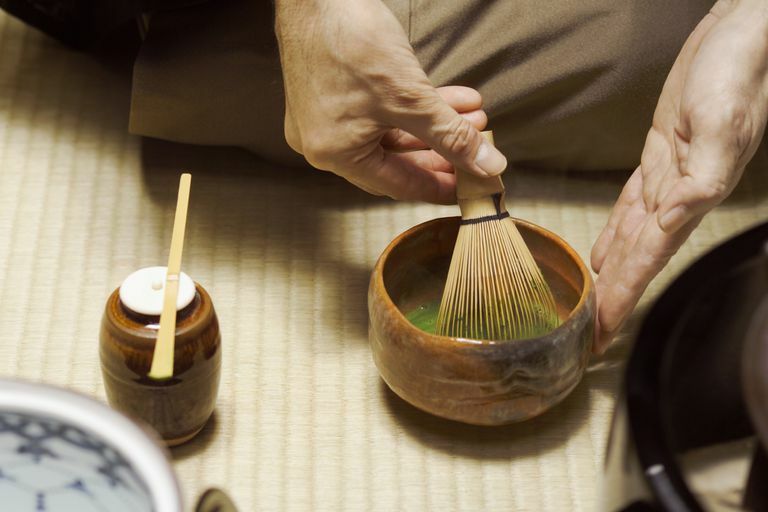 In the 12th century, Eisai (1141-1215), the first Zen master in Japan, returned from China bringing Rinzai Zen as well as a new way to make tea—mixing powdered green tea and hot water in a bowl, with a whisk. This is the method for making tea still used in chado. 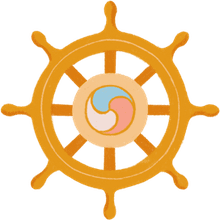 Mindfulness is essential to Zen practice. Along with zazen, a great many arts and ceremonial practices of Zen require complete attention. The folds in a monk's bowing cloth, the placement of oryoki bowls and chopsticks, the composition of a flower arrangement all follow precise forms. A wandering mind leads to mistakes in form. So it was with brewing and drinking tea. Over time, Zen monks incorporated tea into Zen practice, paying attention to every detail of its creation and consumption. What we now call the tea ceremony was created by a former Zen monk who became an adviser to the shogun Ashikaga Yoshimasa. Murata Shuko (c. 1422–1502) served tea in a small, plain room in his master's sumptuous villa. He replaced ornately decorated porcelain with earthen bowls. He stressed tea as a spiritual practice and introduced the aesthetic concept of ​wabi—simple, austere beauty. Shuko's form of tea ceremony is called wabi-cha. Shuko began the tradition, still followed, of hanging a scroll of Zen calligraphy in a tea room. He may have been the first tea master to partition a large room into a small and intimate four-and-a-half tatami mat area, which remains the traditional size of a tea ceremony room. He stipulated also that the door should be low, so that all who enter must bow. Of all the tea masters who came after Murata Shuko, Sen no Rikyu (1522-1591) is the best remembered. Like Shuko, Rikyu left a Zen monastery to become the tea master of a powerful man, the warlord Oda Nobunaga. When Nobunaga died, Rikyu entered the service of Nobunaga's successor, Toyotomi Hideyoshi. Hideyoshi, the ruler of all Japan, was a great patron of the tea ceremony, and Rikyu was his favored tea master. Through Rikyu, wabi-cha became the art form it is today, incorporating ceramics and utensils, architecture, textiles, flower arranging, and the other crafts associated with the total experience of tea. One of Rikyu's innovations was to devise a style of tea bowl called raku. These plain, irregular bowls are said to be the direct expression of the bowl artist's mind. They are usually red or black and shaped by hand. Imperfections in shape, color, and surface texture make each bowl unique. Soon the tea bowls themselves became highly prized as pieces of art. Skyward I throw it up!" There are several variables in a traditional tea ceremony, but commonly the guests will wash their mouths and hands and remove their shoes before entering the room for the ceremony. Food may be served first. The host lights a charcoal fire to heat water in a kettle and cleans the tea tools. Then the host mixes the powdered tea and water with a bamboo whisk. These movements are all ritualized, and to fully enter into the ceremony the guests should be paying attention. Guests sip tea from a single bowl, which is passed among them according to ritual. When to bow, when to speak, how to handle the bowl—all follow precise forms. When participants are fully engaged, the ritual evokes great peace and great clarity, a non-dualistic consciousness and a deep intimacy with oneself and the others present.